Hope you enjoyed the Academy Awards, if you like that type of thing. Personally I fell asleep a half hour in, that's how I felt!!! On to more important things. Murray will be going to the doc again tomorrow. Five week check-up. He is doing better but he has a pin in his leg that is painful for him, at least the location bothers him. You can see that it is sticking out, I don't know if I ever talked about this , but he has at least five pins keeping his shoulder in place. The doc thinks she can take out this one without a problem , so he may be looking at another surgery tomorrow. So once again I am asking for help, of the monetary kind!!! 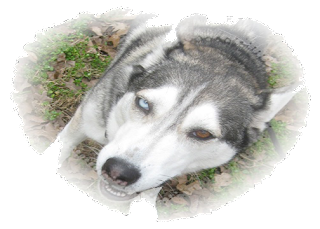 Please go to Husky Haven and donate what you can for this new surgery. I thank you and so does Murray!!!!! I wish him the best tomorrow!!!! Want to say thanks also to our girls that spent the day at Pearland Junior High East last Friday. I have worked a few school events and they are really fun. 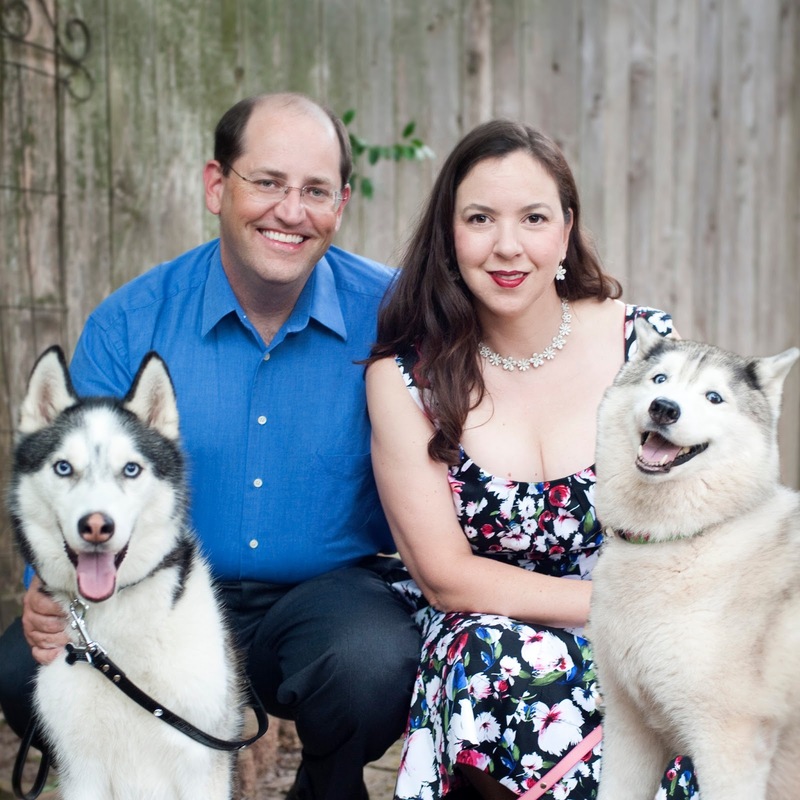 You educate the kids about Huskies and bring your dogs for some love!!! Great picture....thanks Donna, Kim, Cyndi...she organizes this, and Becky. I know they all had a great time there and the kids really did!!!!! So my dogs and I are rooting for "Life of Pi"...we know it won't win...but we have to have a favorite movie. Do any of you watch the awards...do you have a fav movie??? So for all my promises that I was going to write everyday this month, let's say, I'm close. It's been a busy week and I'm learning some new apps so I've been bad. Let's see if I can rectify that!!! 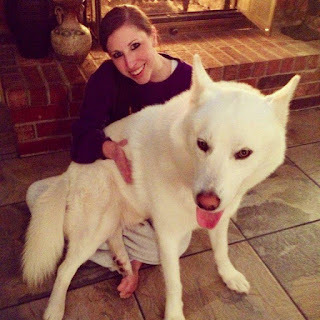 Today our subject is our great friend , Krista , and all the dogs she's helped for Husky Haven. Here she is with her husband and her babies. I met her a few years back when I was tasked to take Yves/Yuri, her foster and another foster to get spay/neutered. Took them, she picked up her foster from the vet and we really didn't see each other much, she traveled a lot for work and also lived on the other side of town. I guess it wasn't till she took Denver that we would be at shows and hang out a bit. Denver is such a sweet boy and she fostered him for over a year, until last July at Reliant. We had a great family that was looking for someone just like Den and decided we could do a meet and greet at the show. Krista brought Denver and they fell in love with him. The next week he was off to a new home. I know Krista loved that boy, I also know that no matter how hard it is you want the best for them. Denver striking a couple of poses!!! 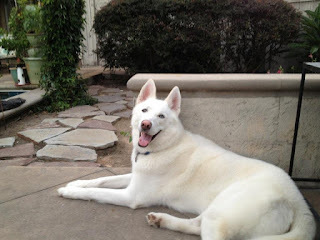 Sweet Denver is having such a great time , such a pretty boy. So then they took Angelina. She is a beautiful , quiet little girl. We actually didn't have her long at rescue before Krista took her. She didn't have her long either!!! 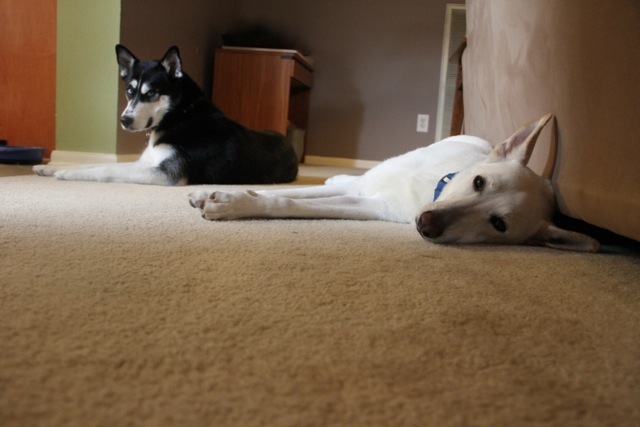 Lina was adopted as a little sis to be a companion to Zoiee. Lina on the way home!!! 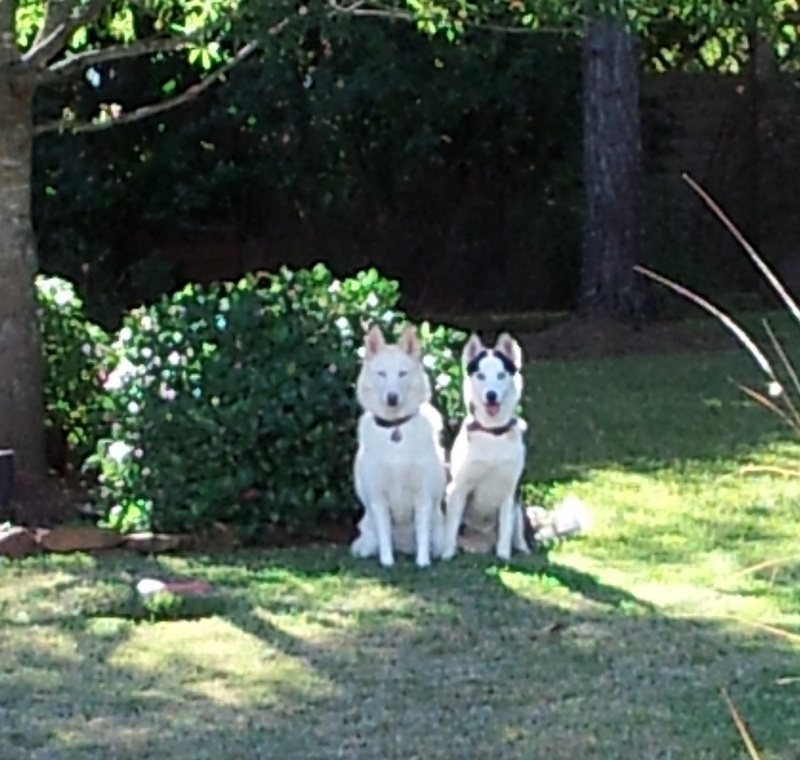 Her name is now Leenah, here she is in the backyard with her sis....they apparently get along famously!! So then she took her current foster, Colin!!! He is so cute, I just loved him. He wasn't around for long before she scooped him up. 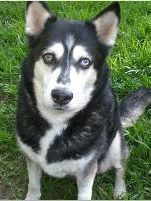 Hopefully he will be the next adopted guy so we can send another foster to Krista....just kidding girl (no not really ). I want to say thanks to all of you that foster and continue to foster for Husky Haven. Thanks, too, for working so hard to get those babies into great new homes!!! 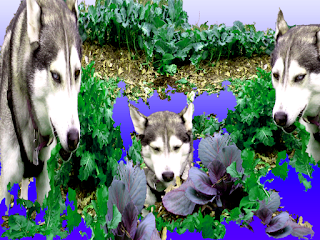 I wanted to add a couple of pictures from the dog park last week.....these have shots of Yuri...enjoy!! We took over the park!!!! We had a Husky get together at the park yesterday. This is Bill Archer Dog Park in Houston.....and it's really big!!! We will be doing our event here in two weeks , so I thought I'd check it out. The dogs were having great fun, I'm adding a lot of pictures and you can see for yourself. Check out the big pool they have and then check out the mud holes the dogs would rather play in!!!! I took a couple of these pictures, but the rest are courtesy of my friend, Becks. So thanks !!!!! Enjoy the kids and have a wonderful day!!!! So Murray went to the Doc this week. The Doc is basically happy with his progress , but feels he walks too much. For the next two weeks he will have more crate time, they are more worried now about his four pelvic fractures, too much movement and they won't heal properly. I know he hates spending so much time laying down, but it's necessary right now. We will do whatever it takes to get this boy well and to a family he can call his own!!! Here's what he looked like yesterday.....he's still in pain but wants to get around!!! 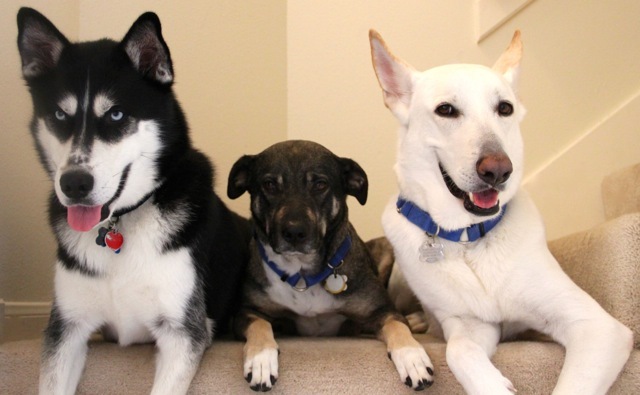 If you can go to Husky Haven and donate , we still need your help!!!! Murray says thanks.....have a wonderful evening!!! I was going to update Murray today, but that will have to wait till tomorrow. Today is my beautiful , lovely Lizzy's birthday!!! She is seven today. I can't believe five years have gone by. Five years ago at the beginning of February I went to the rescue to help out. 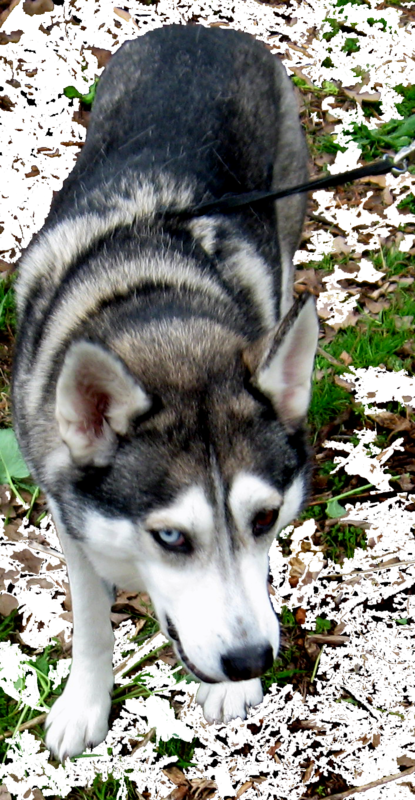 It was a nasty day, rainy and wet, when I went out to work with some dogs Liza came running up and jumped all over me , I was covered in mud, but thought she was the most beautiful girl I'd ever seen!!! I offered to take her to a show one of the girls had signed us up for that weekend. I took her home on Thursday , got her groomed on Friday and took her to the show on Sunday. The whole time we were there all I could think was, leave her alone , she's mine!! By the time the show was over I wrote a check for her adoption and handed it to our director. Lizzy, her new name , was coming home with me!!! That started my love affair with dogs, rescues in particular. I had never had a dog before, and I love all three that I have now like my kids. So I picked Valentines Day for her birthday, since I don't really know when hers is. I also picked it because it's my birthday. I figured the two girls in the house should have the same one. I'm not going to say how old I am, don't want that date posted , since I try to keep most personal stuff off FaceBook and such, but this one scares me. I realize I already lived most of my life and I have more that I want to do. I have many things in the works for this year , and I plan on doing all of them. But, that being said, Miss Liz has many more years here with me and I wish her the happiest of birthdays. I will have an update on Murray tomorrow, he will be going back to his vet in the morning and we will see how he is progressing. Let's hope for the best. We are a little over half way to our money goal for him.....if you can help please go to Husky Haven to donate.....Thanks. So I have a couple of good things for today. 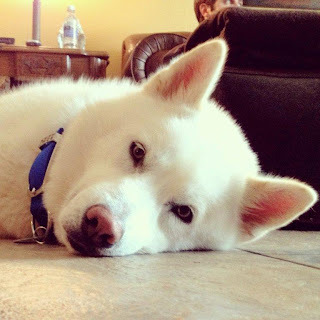 Last week I posted on Husky Haven's FaceBook about a puppy that had a day to live. She is a tiny little thing only about 9 pounds....and some Husky. Our readers stepped up to the plate and she got a sponsor and a foster. We literally got her out of there just in time. Her name is Sassy now and she is sweet and playful. I should have some pictures of her soon!!!! Her foster is a great friend to the rescue, Charlene. 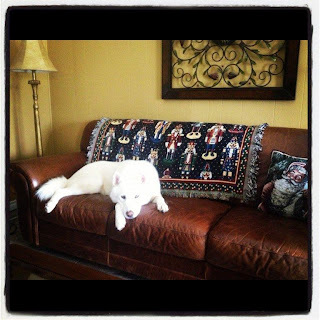 Last week she sent me a collage of all the dogs they had fostered....I thought it was so great I decided to put it on my blog. This was put together by her daughter, Sammy. She gave me her go a head this weekend to post it when they picked up Sassy. Sammy, I guess you have another dog to add to your collage. Thanks for fostering and thanks for the beautiful picture!!!! So I wanted to do an update on Murray. He stands and walks a bit to pee and poop....but he will cry all the way. He sits as you can see , but once again I know it hurts him. He's trying....he really wants to run and play, every time he sees those squirrels his ears perk up. He has a long way to go, if you can help , please go to Husky Haven and donate...we don't care how much...we are still short of our goal. Murray needs your help!!! He made me these beads....thank you so much.... they are beautiful!!!! Please help Murray if you can...we all appreciate it. This is just a quick post tonight....thanks to all of you that sent the love for Thelka. I have to write about the passing of one of our senior girls, Miss Thelka. I know I was going to write upbeat stories this month, but in life terrible things happen. We really didn't anticipate that she would fail so fast , she had become incontinent and had no control over her bowels for the last month or so, but we could clean up and she was still able to get around. This last week she lost use of her back legs and was no longer able to walk , we also knew she was in pain. 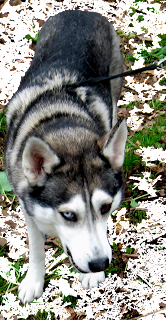 After a very tortuous decision she was taken to the doc to make her final passage to the Rainbow Bridge. It was very fast and our director was feeding her the favorite salmon cookies her sponsor Cheryl would send every month. 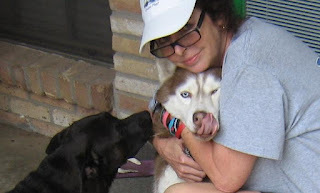 She knew she was loved and had her head in our directors lap as she took her final breath.She will be cremated and her ashes buried at Husky Haven. Just a bit of back story I think she was an owner turn in to animal control at the age of eight or nine. She wasn't the most affectionate Husky, but I understand that having your life change after so much time , she was much more wary than she probably had been. She had been with us for many years and that was probably where she was going to stay. She had her own huge fenced in area to play in and had the run of the house a lot of the time. In all I think her last years were happy ones. I would like to thank our friend Cheryl for all the treats, toys and donations she sent to Thelka. All of us really appreciated it, especially Thelka. I was getting my post together for today when I got an email from Laz. He asked if he could say something on my blog and of course I said yes.....so here is a note from him!!!! Well it has been a couple of months since I emailed y'all. The holidays came and went. Christmas was a joyous time!! We had the whole family over to bake lots and lots of cookies. I discovered I liked cookies very much!! On Christmas morning I opened presents from Santa. However, New Year's Eve was a different story. I realized I do not like fireworks!! 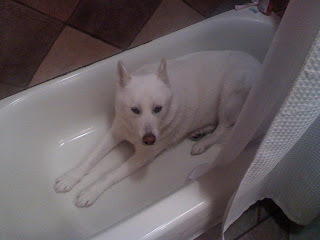 I spent the evening in the safest place I could find.....the bathtub. I slept in bed with mommy and daddy that night!!! My mommy says I that i am the biggest "lap dog" ever. She is trying to train me to stay off the sofa, but as you can see from the pictures, it's not really working!!! I am trying to be a good boy. I wanted to do a quick update on our girl Sky. Sky is doing great with her daddy, James. He really loves her, and apparently she loves posing for pictures!!! She's such a pretty girl and I'm glad they are so happy!!! Just a few pics to show how she looks today!!!! Sky's other friend Liz has a new camera and has been trying some new techniques......so of course I'm always happy to show them on my blog!!!! Thanks guys and I hope there will be many more to come. Looking great sweet girl!!!! Well my Niners didn't do the job yesterday......oh well, maybe next year!!!! So I have some good things and bad things for today. 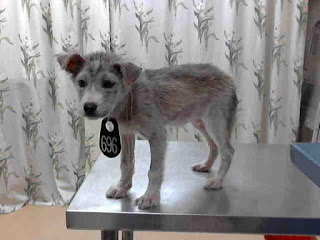 I was trying to do all good stuff for this month, but I know that can never happen in rescue. Good stuff first, we will be having a day in the dog park on March the third. 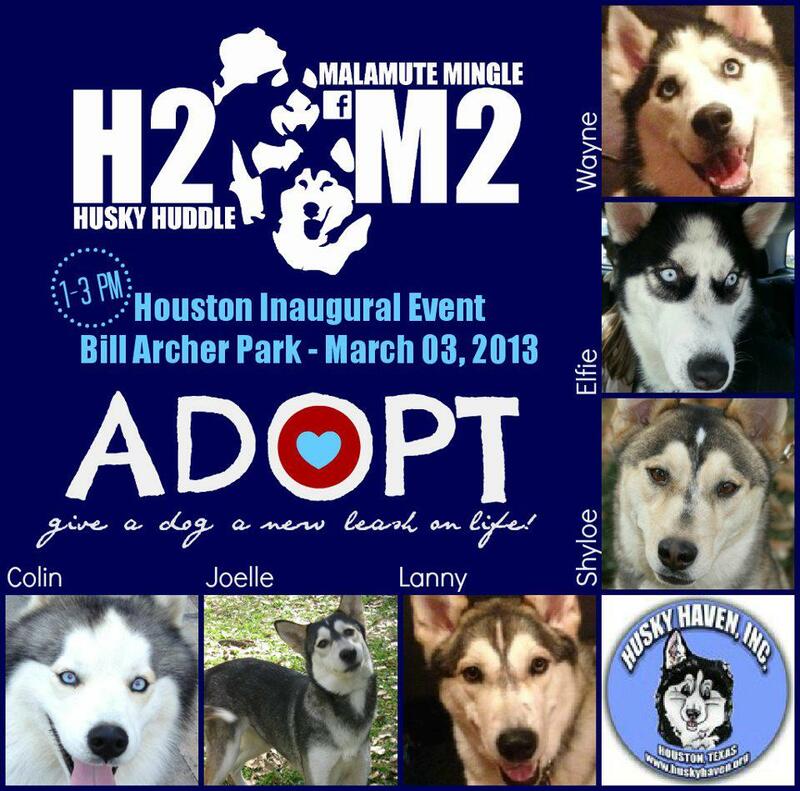 The afternoon is dedicated to Husky Haven and we will be bringing adoptable dogs for everyone to check out!!!! I know we have six on the posting....but hopefully we will have more great dogs there looking for a good home!!! 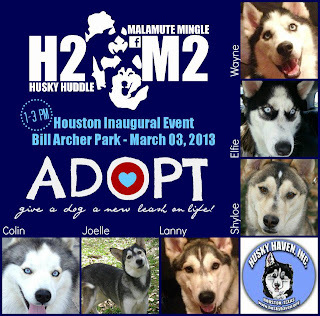 If you are in the city of Houston, please come and check it out that day!!!! We are so excited to be doing this event!!! So for the bad news portion of the post....my friend Becks was driving to the kennel this morning to have some quality time with one of our dogs, when she found a dog running in the street. A couple of guys working in the area said that a car slowed down and pushed a box into the street, a dog came running out. They were afraid there were puppies in the box....but thank goodness it was only the dog. My friend caught the dog and is getting ready to vet it. It's a sweet little girl, we'll need to find it a home. Obviously the family didn't want her. I will never understand humans.....I could never do that to my baby. If you are interested, please contact me....we would like to find her a real home. I know a lot of you are not into football....but I am!!! Go Niners!!! Wanted to show you one of our babies that was adopted this year......Skylar!!! 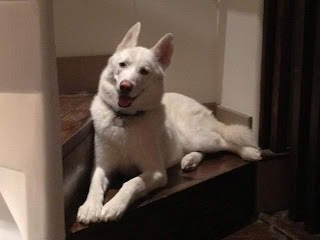 He's a beautiful baby.....love you boy....know you will have a happy life with your new friends and Max your new owner!!! 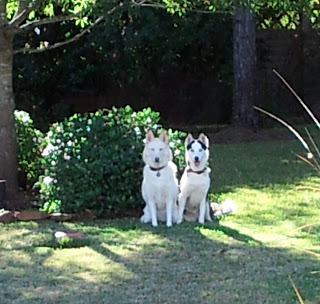 This is a quick post....wanted to say Happy Birthday to our puppies....they were a year old on the 26th of January!!!! Miss you and know you have the best homes ever!!! !